This dinner has beautiful colors, great taste, and amazing texture. We really liked it. Heat oil in a good sized pot, fry the onion over a medium heat for a minute or two, add the garlic and chili and continue to cook for another quick minute. Add the fennel seeds and the curry powder with a splash of vegetable stock, fry until the curry powder, stock, and onion form a paste, being careful not to burn the curry powder and fennel seeds. Add the potatoes and carrots with a little more stock and continue to cook over a medium heat for a few minutes, tossing the vegetables around to coat well in the curry mixture. Add the barley and almonds, toss to combine and then add the remainder of the stock, bringing to a gentle boil, allowing to simmer for 40 minutes, stirring occasionally, until the barley is soft and the stew is thick. Add the diced zucchini and stir, cooking for another 5 minutes. Add and stir through the lettuce just before serving. Makes 4 – 6 servings. It’s February, and winter is far from over. Warm comfort foods to the rescue. 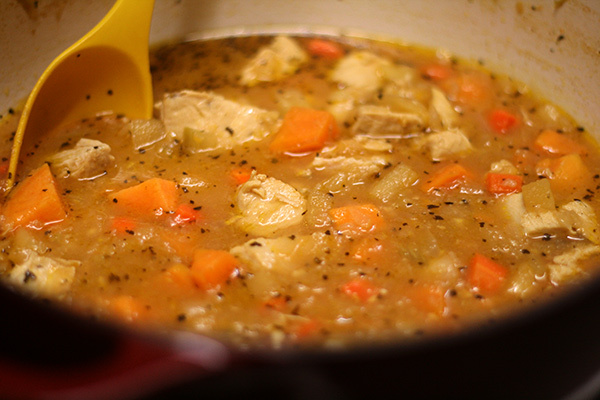 This stew keeps you warm, and the gravy is fantastic. Very easy to make. Heat oil in large pot over medium heat. Add onions, celery, and chicken to the pot and saute, stirring regularly, until onions are golden and chicken is cooked through. 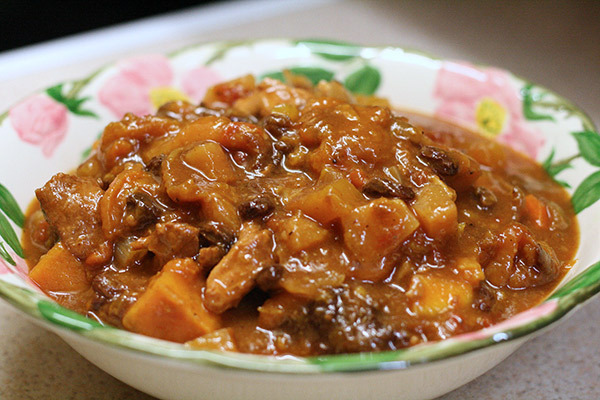 Add carrots, sweet potatoes, and apple and let cook 3 – 5 minutes, stirring occasionally. Add apple cider, water, ketchup, salt, savory, basil, and pepper. Let simmer over low-medium about 20 minutes until carrots and sweet potatoes are cooked. Put flour in small dish and slowly add 1/2 cup hot liquid from the stew to make a smooth paste. Stir into the hot stew and cook another five minutes. Makes 8 cups. 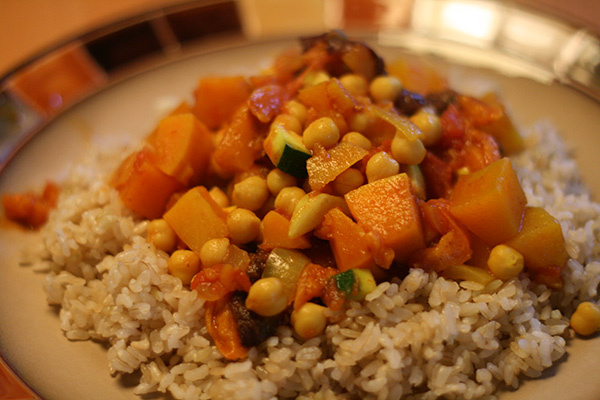 This is the second Moroccan stew that I’ve tried my hand at – the first one I made here. We really loved this one. It called for beef – I used chicken instead. Brown the chicken in the olive oil in a large pot over high heat; add the onion, garlic, chili, and spices and saute until the onion is softened a little. Add the black pepper, bouillon cubes, bay leaf, and water; cover the pot, bring to a boil, and allow to simmer for an hour, or until the chicken is very tender. Add the tomatoes, carrots, kale, red and brown lentils, and raisins; bring up to a boil, cover the pot, and allow to simmer for 30 minutes. Stir in the chick peas and turn off the heat. Serve with fresh chopped parsley on top. Makes 6 servings. (don’t forget to remove the bay leaf before serving). A lovely variation on a theme. Serving chili including butternut squash and seasoned with Middle-Eastern spices just seems so logical. Another delicious selection from Williams-Sonoma. In a saucepan, combine the chilie and water and bring to a boil. Remove from the heat, cover, and let stand for 15 minutes. Using tongs, transfer the chilie to a work surface, reserve the liquid. Discard the stems and seeds from the chilie. In a food processor, combine the chilie with the whole garlic cloves and 1/4 cup of the liquid. Process until smooth. Set aside. Heat a heavy pot over medium heat. Coat the pot with nonstick cooking spray. Add the onion, sliced garlic cloves, turmeric, cinnamon, cumin, and coriander and saute until the onion and garlic have softened, about 5 minutes. Stir in the tomatoes and their juices, butternut squash, and the chilie puree. Cover and simmer, stirring occasionally, until the squash is just tender, about 25 minutes. Stir in the chickpeas with their liquid, the zucchini, dried apricots, and prunes. Simmer, uncovered, until all of the squash are tender, about 15 minutes more. 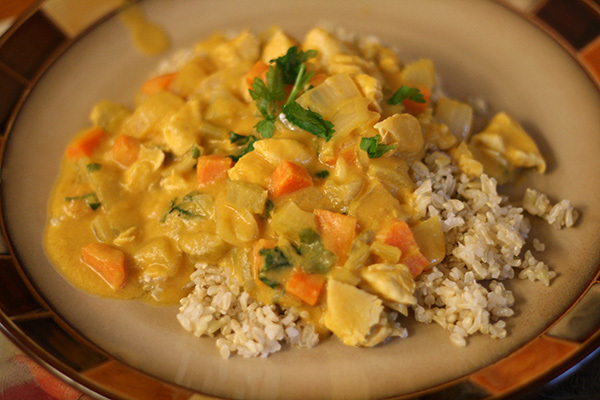 Transfer to a serving dish and serve hot, with pita, or rice, or couscous. Makes 6 servings. This dish had me at first glance. But upon tasting it, this dish grabbed me. The flavors all come through and work well together. 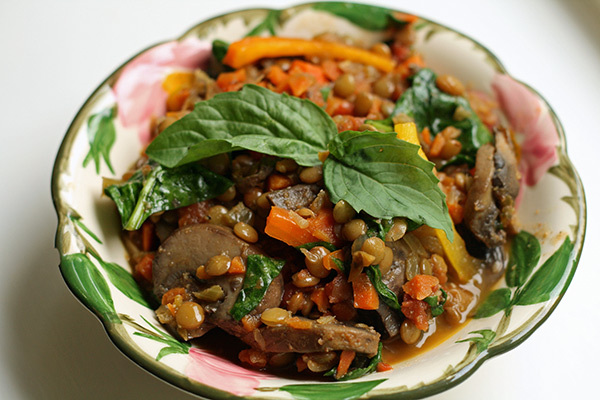 This is not a mush of vegetables; it is an outstanding chewy-like stew of wonderful textures and bites, sitting in a pool of flavorful, light gravy. Can you tell we liked this? Highly recommend. I went a little light on the addition of black pepper – other than that, I completely followed the recipe. PS – her food photography is beautiful and crisp. Heat olive oil in a very large pot, on medium, and add onions; cook until softened and slightly golden, about 3 – 5 minutes. Add garlic, carrots, and celery, and continue to cook for about 5 minutes or until the vegetables are tender. Add the mushrooms and cider vinegar, topping off with spices. Cook for 15 minutes, stirring occasionally. Add the lentils, canned tomatoes, vegetable stock, salt, black pepper and cayenne pepper. 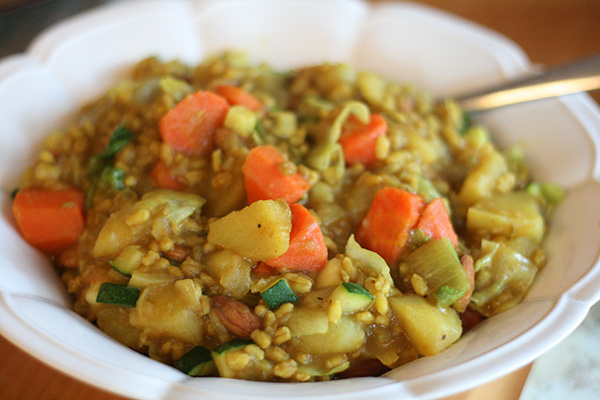 Bring to boil, cover, and simmer until lentils are tender and most liquid is absorbed, about 20 minutes. 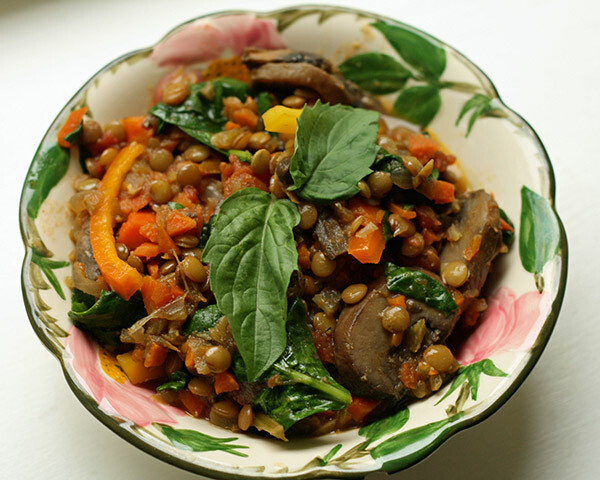 At that time, add the colorful bell peppers and spinach, and cook till the spinach is wilted. Stir in the lemon zest. Serve with warm pita bread, coucous, and a drop of hot sauce. Serves 8 – 10. This stew is rich in color and flavor. I just love how it all goes into the crockpot and 6 hours later – the most wonderful hearty delectable dish. We’re not big on beef in this house, so I simply used chicken breast instead. It’s a long ingredient list, but it all dumps into the crockpot quite easily. Toss chicken with the flour in slow cooker. 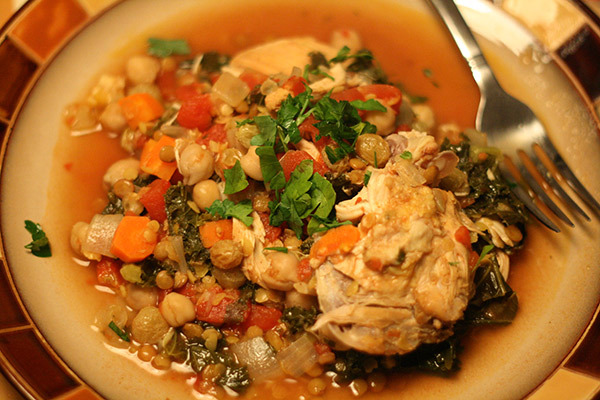 Cook in slow cooker on high for 4 – 6 hours or until chicken is cooked and veggies tender. Top with slivered almonds and chopped parsley. Serve over couscous, rice or mashed potatoes. Makes 8 servings.